Are you growing a beard? Well, if you are, there are plenty of mistakes that you should work on avoiding. Below, are the top five mistakes we gathered that you should avoid doing while trimming your beard. If you’re planning on trimming your beard with an old or dull razor or pair of scissors, think again. If you are trimming with a new, disposable razor, it can only last a week at max, so you shouldn’t use it for longer. Not only can using the wrong tools cause health concerns, but it can cut your face, cause razor burns, and make your beard look bad. Generally speaking, trimming your beard should be a simple and non-painful process. This is why it is so important to have the best manscape tools. With the right tools, you can avoid any pain, discomfort, and uneven facial hair. On your face, your hair may grow differently in different spots. In some areas, the hair may be thinner than in other areas. Some men may have thinner hair along their jawline whereas others might have a thinner mustache. Regardless of where the thin spots are, it is important to pay special attention to them when trimming your beard. You do not want to trim too much of the thin hair or you may end up removing it all together. This will leave your beard looking patchy as some sections will be thicker than others. One way to avoid this issue is by changing the setting on your clipper when you are trimming back the thin hair. Set your clipper to a longer length to prevent yourself from cutting off too much hair. If a steady 5 o’clock shadow is more your style, you still need to do your part to maintain your look. You can’t simply let it grow and hope for the best. Stubble actually requires a lot more maintenance than most men realize. Each individual hair grows at its own rate. If you do not maintain your stubble, it will grow to various lengths and look messy. You must regularly trim it to keep it at the right length. You must also moisturize your face and neck every day, so it does not become itchy or rashy. Additionally, when maintaining a stubble look, you should also shave the edges to create a neck and cheek line. This way, your stubble will look intentional and not like you just rolled out of bed. Even though you may love a low-maintenance, natural look, you still need to maintain and trim your beard. You cannot grow a luscious, full beard by just letting it grow. Just like a tree, you must prune it occasionally to ensure it is growing healthily and correctly. Trim the stray hairs that seem to do whatever they want. And don’t think that trimming your beard frequently means it will take longer for it to grow in. In fact, it will simply make your facial hair look better when it does grow back in. It will look denser and tamer. Many also think that trimming will make their beard look thinner however, this could not be more untrue. By cutting off the unruly whiskers, you will keep your beard looking thick and full. 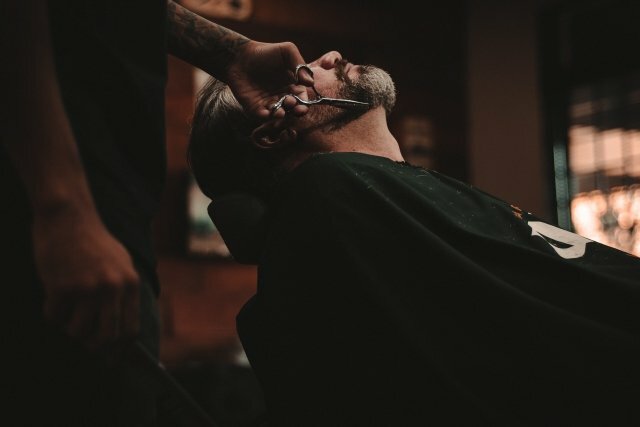 No matter what your end goal is, remember that it is important to trim every now and then to make sure that your beard looks as great as possible. Trimming your facial hair should not be rushed or completed hastily. It requires patience and care. So, if you are running late trying to get to work, resist the urge to give your beard a quick trim. You will likely end up looking like the victim of a prank with half of your beard missing. You can either shave your beard completely or trim it more than you wanted to. Either way, you will not be happy with your hasty decision. This is why it is so important to use care when trimming your beard. Even if you have done it many times before, each trim should be completed with as much care as the first time. Take your time and really concentrate on the task at hand. By doing so, you can avoid any missteps and keep your beard looking great for a long time to come. A lot of work goes into maintaining facial hair. Trimming your beard is necessary to ensure that it remains healthy and grows in correctly. The next time you trim your beard, make sure you avoid all of these mistakes. Pretty soon, you will have the beard of your dreams.